Not sure if it's plausible to redeploy the instrument once it's release. There's no way to draw it back up, is there? No, once its drilling, it's one way only. Animated GIF cropped from processed ICC frames from sols 89 & 92. It shows the movement of HP3 after the mole was released, I selected these frames because of the similar solar time. Do any of the geologists here have an idea whether there could be a layer of relatively impenetrable consolidated material — e.g., a natural cement — that, unlike pebbles or stones, makes it difficult or impossible for the mole to move it or go around? Not a geologist, but I have been wondering about duricrusts. IIRC, Elysium is primarily a volcanic province but sand covers all on Mars. There could well be ancient evaporite deposits almost anywhere beneath the surface, I'd imagine. was a shallow sea at one time. So, there may well be buried duri-crusts or conglomerates or drainage delta materials. The deviation of the probe was expected if it encountered a rock and this is taken into account in analysis of results. The rocks exposed on the surface and the size of those excavated by the thrusters does seem to indicate a reasonable probability of encountering an obstruction, so I doubt we need to hypothesize evaporates or buried duricrust. But on Mars we are in the position of dark ages navigators. Here there be dragons, which is quite exciting really. Sol 92 & 94 ICC GIF Showing what looks like the upper part of the HP3 'Mole' after the 2nd hammering attempt on sol 94. So the current depth is 30cm. 50 cm is needed for the first temp measurement. Tough going. There is a large collection of IDC & ICC frames from sol 96. These may be one attempt over several sols to capture the shadow of Phobos as it crosses the terrain around the lander mentioned in the HP3 blog linked in the previous post. 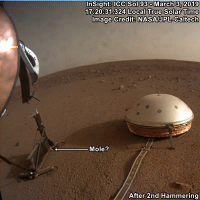 I think the IDC images may be pointing at the ground covered by HP3's radiance sensor 'RAD'. I've reviewed all the images from both cameras that were downlinked (so far) but can't see any obvious darkening. I'm not sure if these cameras are auto exposure and may have compensated for any variation of lighting, or if the shadow passed over between frames. Pretty sure the cameras are not auto exposure. They are flight MER/MSL spares with just the addition of a Bayer filter mask. Identical software and electronics. No reason to suggest they don't have auto-exposure, which MER and MSL did. In regards to the SP3 mole issues. 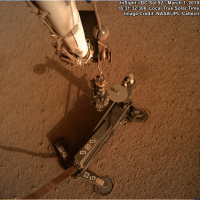 Why not use the strong, capable arm with it''s unused scoop to dig a deep trench next to the instrument down to the depth that the mole was having issues penetrating to see what we are up against?  Knowing that information visually would help in the testbed work out ways to get around it. At the very least determine what stopped the mole if it is unable to get through and help redesign it to handle simular situations on future missions that include something simular to it. The only reason I could think of to not do that would be potential cave in''s effecting the SEIS data. In that case, just fill in the trench after. "Excellent news! We just got the data from the first Phobos eclipse observation and the cooling by the shadow passing through the fields of view of the radiometer in about 30 seconds is clearly visible. The cooling is by about 1°C and is thus somewhat larger than expected and certainly better than with the most pessimistic estimates (that would have said, we will not be able to see it at all)! So the team is happy and is rejoicing about the first eclipse on Mars ever observed with a radiometer."